Search on all content across the practicePRO website. Use the filtering tools ( ) to narrow your search. Alternatively, you can review the site map. Articles, tools and resources on risk management and claims prevention appear throughout our print and web-based materials. Below are direct links to this content arranged by topic or issue. Click on any topic heading to see an expanded list items on that topic. 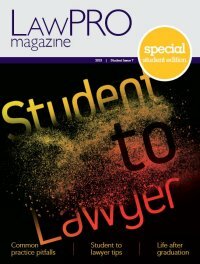 You can also view all past issues of LawPRO Magazine or view a full list of all LAWPRO articles.